THE use of the Keyline as a guide or design for cultivation is discussedin this chapter. Keyline is a complete planning guide for farm development. it wouldseem that an overall picture of the plan should come before the details of Keylinetechniques. This, however, would involve so much discussion and digression to explainnew terms that it is proposed to present the various factors which make up the completeplan in the order that appears best for the sake of clarity. This order may not bein the proper sequence of events as they would be applied in practice. As the various methods which make up the complete Keyline plan affectand react on each other, some repetition is necessary. Keyline cultivation is simply cultivating parallel to the Keyline. In the various methods of cultivation of the soil to prepare landfor sowing, several "workings" may be used. A "working" is acomplete covering of the land area at one time with whatever implement is in use. If one cultivation only is to be done, this single working parallelsthe Keyline moving away from it. Cultivation that requires more than one workingto complete it is done parallel to the Keyline on the last working only. Map 2 is identical to Map 1 except that the Keyline, the 180-footcontour, has been emphasised and parallel lines have been added. These lines illustratethe parallel furrows of Keyline cultivation. The-parallel lines of Map 2 are drawnparalleling the Keyline. Above the Keyline these lines parallel the Keyline moving away fromthe Keyline up the slope of the land. Below the Keyline they parallel the Keyline moving down the slopeof the land. 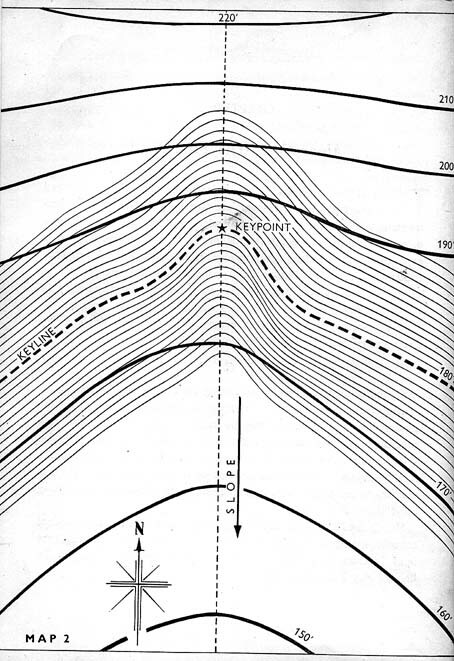 Study of these parallel lines shows that above the Keyline they donot evenly "cut-out" the valley and ridge slopes in the first contour strip(190ft.-180ft.). The valley section is "cut-out" before the ridge sectionson either side of it. These lines represent parallel Keyline cultivation runs working awayfrom the Keyline up the slope. When the cultivation lines reach the 190-foot contourin the valley they are some distance from and below the same contour lines on thetwo adjacent ridges. They have reached a greater vertical height in the valley thanon the adjacent ridges. The parallel cultivation lines which started on the levelor contour at the Keyline are higher in the valley than on the adjacent ridges. Theyslope downwards from the steeper sloping valley to the flatter sloping ridges oneach side. This parallel cultivation is continued to the upward limit of thearea or paddock. When the cultivation reaches this point, there will be parts leftunworked. These are cultivated out in any convenient manner without reference tothe Keyline or parallel working. Their influence will not alter the effectivenessof Keyline cultivation. Below the Keyline the parallel lines of Map 2 start at the Keylineand parallel below the Keyline down the slope of the land. The cultivation that theyrepresent does not evenly "cut out" the valley and ridge slopes in thefirst contour strip, that is from the Keyline to the 170-foot contour line. Theyreach the 170-foot contour on the ridge slopes first while the run in the valleyis some distance from and above the 170-foot contour line in the valley. The cultivationruns are again generally higher in the valley than on the adjacent ridges in thesame contour strip. They also have this same downward slope out of the valley tothe adjacent ridges, as the cultivation above the Keyline. The slope of the cultivationfurrows is now from the flatter sloping valley to the steeper sloping ridges, whereasabove the Keyline the slope is from the steeper sloping valley to the flatter slopingridges. The cultivation of the area below the Keyline is completed by continuingthe parallel cultivation downward to the boundary. When this is reached, areas notcompletely cut out are cultivated in any convenient manner. Again their influencewill not alter the effectiveness of Keyline cultivation. (1) Rainfall on or near a valley rapidly concentrates in the valley and flows	off the area not only preventing the ridges from absorbing their fair share of the	rainfall, but in poor soil, taking with it some of the soil from both valley and	ridge. (2) Keyline cultivation is in effect many hundreds or thousands of very small	absorbent drains, preventing rainfall from concentrating in the valley--thus resisting	and offsetting the natural rapid concentration of this water into the valleys. Very heavy rainfall, after it has completely saturated the soil whichhas been cultivated in this way, naturally starts to move to its normal concentrationlines in the valley. But it is interrupted by the tendency of almost every cultivationfurrow to impede it and drift it away from the valley. The flow movement of excesswater is widened and its flow is kept very shallow. The necessary time of concentrationis increased enormously, thus holding the water on the land longer. The land willhave time to absorb the rain that falls on it. Rainfall of maximum intensity is robbedof its destructive violence. Keyline cultivation is completed in the order already discussed. Cultivationabove the Keyline is first completed to enable land, usually the steeper areas, toabsorb the maximum or all the rain that falls on it. This prevents rapid and concentrated run off on to the flatter slopecountry and so protects all the land from water damage. The general result is evenabsorption of rainfall over the whole surface of steep land, similar in effect tothe absorption of rainfall on flat, fertile, absorbent land. This part of the significance of Keyline as a cultivation guide hasbeen illustrated on the map with reference to contour lines both above and belowthe Keyline. The only need for these contour lines is for the sake of simpler presentation.The Keyline is the only line which is necessarily marked on the land area representedby Maps 1 and 2 for the practical application of Keyline cultivation. On large areas of long slope country where, for some reason, continuanceindefinitely downward of the Keyline parallel cultivation is undesirable, a lineis used to terminate one cultivation area and form the boundary for another. This line is called a Guideline and is usually a true contour line,marked at a suitable distance below the Keyline. It may be a quarter mile or muchfurther below. The area below this Guideline is Keyline cultivated from the Guidelineparalleling it downward. Any contour line below the Keyline can be used as a cultivation guideby simply Keyline cultivating from the line downward. The effect of Keyline's cultivationdiffusing and even spreading of rainfall is still completely effective. For Keyline cultivation a special implement is needed, which properlyfollows the new working lines and for other significant reasons. These are discussedlater. Although the Keyline as illust rated in Map 2 is a contour line, Keylinecultivation is not strictly contour cultivation. It is rather an "off the contour" type of cultivation, whichin no small measure depends for its effectiveness on this planned drift away fromthe valleys. Keyline diffuses rainfall evenly over the whole of the land to absorbit in the greatest water conservation storage area--the land itself. The field of application of "Keyline" extends in scope greatlyfrom this simple first principle now presented. Keyline planning can be applied on an area of virgin grassland orforest to develop it into a farming or grazing property. In timbered country it plansthe clearing to retain timber in the best places; it positions the house or homestead,all other farm buildings, entrance and farm roads, large and small paddocks, damsites and irrigation areas. It guides the whole course and sequence of developmentas well as the details of all cultivation for soil fertility improvement and highyields. It can be applied as a planning guide to the layout and developmentof a public park or to the further improvement of a fully developed wheat farm ora fine grazing or dairy property. Occasionally a very large property may have two sets of Keylines,but generally these wider applications are outside the scope of farming and thisbook, applying only to such developmental projects as the entire watershed of a riversystem. "Keyline" will apply to a single small or large paddockof a farm or to land partly destroyed by erosion. Although it cures and prevents soil erosion, this is incidental toits purpose--the development of fertile soil by the factor of absorption.